A wild, wonderfully bizarre, and entertaining combination of puppetry, film, live acting, and music with a moving underlying story. Flo, an aging white woman with dementia, is a retired manager from a local auto plant in the Midwest. Now, at home, she is addicted to buying stuff from shopping channels on television. Louise, a black woman, has recently been laid off from the auto plant and takes a job with Meals on Wheels. When she begins to bring Flo her meals, they develop a relationship which sees them, in a poignant way, through the next stages of their respective journeys. What a weird and wonderfully strange show this is, full of completely adept techniques but sufficiently free-form to give the feeling of some improvisational quality. Combining puppetry, film, projection, music, singing, and live acting, this carefully tuned and beautifully executed production manages to exhibit both adept coordination and a free and loose sense of fun. The unique techniques used and developed by Manual Cinema, the nine year old Chicago-based theater that has developed this production and brought it for its week and a half run in Boston, demand a real choreographic sense to coordinate and execute the desired effects. 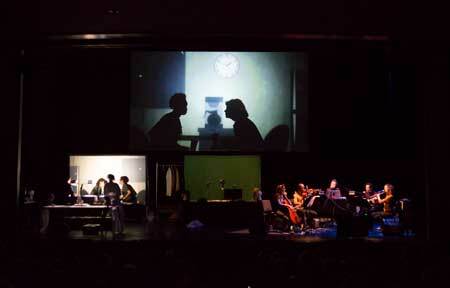 With what seem like unbelievably fine-tuned timing, the four members of the cast align gels and cutouts on old-style overhead projectors which then throw images on a secondary screen from which a projection to the audience is relayed. In a second part of the stage, a blue-screen against which the actors, frequently donned in hilarious wigs and outfits, prance about enacting various silly quotations from television past. Those are melded with background images and also amalgamated with sometimes silhouetted actors and puppets on the main audience screen. It all sounds very complicated but the marvel of Manual Cinema is that they have let all of their production plumbing show so that one can not only see the final video amalgamation but can watch the actors construct the various pieces that go into it. The result is rough, funny, and completely engaging. As well, there are five musicians arrayed on the right side of the stage. They include various instrumentalists, some of whom sing as well. They play a series of eight different songs throughout the performance. Vocals for the minimalistic but evocative lyrics (included in the program) are done with beautiful and haunting harmonies. The narrative of Flo and Louise is simple but charming and effective. The collage-like array of crazy takeoffs on lots of old TV shows and advertisements, adds to the sense of chaotic fun. Yet the wonderfully silly TV riffs all come within a context of the deeper, silently depicted, story of the two women who engage serendipitously but significantly. The entire story of Flo and Louise is told through dynamic silhouette images set upon various backgrounds. Apart from the songs, only the TV takeoffs involve verbiage. The sense of the quiet but pervasive significance of the unspoken connection that prevails between people, beneath the level of media, gives rise to the significance of the show’s title. Though exhibiting a humorous appreciation of all of the miscellaneous idioms of TV, the production calls out to those important qualities of relationship which are so frequently obscured by the jangle of omnipresent media.